“Lost and broken, Celaena Sardothien’s only thought is to avenge the savage death of her dearest friend: as the King of Adarlan’s Assassin, she is bound to serve this tyrant, but he will pay for what he did. Any hope Celaena has of destroying the king lies in answers to be found in Wendlyn. Sacrificing his future, Chaol, the Captain of the King’s Guard, has sent Celaena there to protect her, but her darkest demons lay in that same place. If she can overcome them, she will be Adarlan’s biggest threat – and his own toughest enemy. Sarah J. Maas has made me a fan for life with Heir of Fire. All of the action/romance/fantasy I've come to expect from her was bumped up to an entirely new level with the third installment of the Throne of Glass series. Heir of Fire is nearing 600 pages and it's entirely devoted to character development. It sets up an intricate plot for the rest of the series, gives us heartbreakingly romantic moments that somehow rely on the narrator and not the love interest, and proves that Celaena Sardothien is somehow an even bigger badass than everyone thought, while also showing us the sad, broken girl inside. In case you couldn't tell, Heir of Fire has ruined me for all other books for a while. Total book hangover. I'll admit, at first I was a little put off by the direction the story was taking. It starts out a little slow, with all of the characters separated by the events of Crown of Midnight and Celaena seemed broken down by those events, but, even so, Heir of Fire can't be described as anything but a non-stop thrill ride. But it did take a while for me to get into each of their separate stories. It was drawn out, clearly setting up the rest of the plot, but it was slow when compared to the beginning of the first two books. Too many POV's distracting from the main story. But, oh how it all came together in a beautiful symphony of storytelling. Manon, a deadly Ironteeth witch, is one of the new characters. I kept wanting to get through Manon's chapters quickly. And that's not because her chapters weren't equally as good as the others, I just wasn't as interested in her story as I was with the characters I already knew and loved. I won't say her story isn't interesting though. It's wrought with danger, death and dragons (sort of). And even made me feel compassion for an Ironteeth witch! I'm guessing Manon and her coven play a big role in the next book, and possibly the rest of the series. Which is awesome because by the end of the book, I was very much interested in what role she'd play in Celaena's world. Then there is newcomer Aedion, who I really didn't think I'd like at first, but once I saw things from his perspective he won me over immediately. As a fierce general to the king, he's shady and seems cruel, but he's also Celaena's long lost cousin and his dedication to her is heartbreaking at times. Plus there's the, ahem, bromance. (Yes, it is as adorable as you might be thinking, but no I will not not tell you who it's with.) Aedion is definitely a new favorite in this series. There are many new, lovable faces in Heir of Fire, but not one of them even comes close to beating out Rowan for the title of best new character. Some of you might not like Rowan at first, but once you witness the full extent of his relationship with Celaena you will be unable to not love him. Plus he's stubborn and a total badass. Basically Celaena in guy form. Oh Dorian, poor, ignored, Dorian. I love how Dorian really comes into his own in Heir of Fire, while still maintaining his love for Celaena and Chaol. I love how much Chaol and Dorian truly care for one another, even when they're mad and confused. Plus, Dorian strikes out on his own a little and makes a new friend (*whispers* it's a girl *eyebrow waggle*) that I absolutely adore, but no spoilers. Now, I know in the beginning of this series there was a wee bit of a love triangle and some may feel the addition of some characters could complicate things even more in the future, but I've always been firmly Team Chaol. And that did not change in Heir of Fire. Chaol broke my heart, every time he thought of Celaena and doubted he'd ever see her again. Not to mention how dead set he is on protecting Dorian, no matter what. The way he grew and changed as a result of discovering Celaena's secret was unexpected, and the most heartbreaking thing of all. Chaol is a warrior whose world has been flipped upside down and who has no idea what he wants to fight for. He's too perfect even though he is far, far from being perfect, and Heir of Fire reminded me again and again why I fell for him so hard in Throne of Glass. But it all comes back to Celaena in the end. As much as I love Chaol and Dorian and now all of the newcomers, my devotion to this series boils down to my love for Celaena. From the very beginning she's been a warrior, but a rebel without a cause. Finding herself on a boat to Wendlyn was possibly the best thing that could have happened to her, and it's incredible to read Maas transition her heroine from badass assassin, to broken girl looking to drown out the guilt, to the extraordinary woman she becomes in Heir of Fire. Honestly, this isn't even a review, it's an ode to Sarah J. Maas' incredible ability to tell stories. 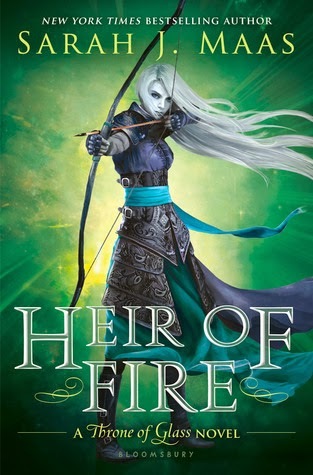 She weaves Celaena's story together in a way that will leave readers thinking about Heir of Fire until the next book in the series is released. So if you're a fan of fantasy or just love a good story, pick up the third book in this series (or the first if you haven't had the pleasure) and get swept away the way I did. For more about Heir of Fire by checking out these sites! My review is just liike this! I loved this so much. Rowan is my favourite character in this book hands down. He is such a well developed character and I love his relationship with Celeana. It seems genuinely platonic! I agree with you when it comes to Mannon's POV. I found it a bit pointless at times. It was good but I wanted some of the other story! I really have to find some time to start with this series, everyone seems to be loving it!